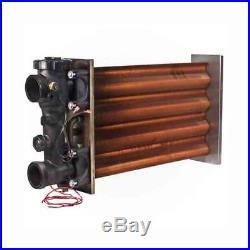 Heat Exchanger Assembly for Hayward FD350 Heater FDXLHXA1350. Heat Exchanger Replacement Procedure. Heat Exchanger Service Parts Kits for Universal H-Series (Forced-Draft) Heaters. This kit is intended to be used only with Hayward Universal H-Series (forced-draft) gas heater models. This instruction sheet is intended for the following heater service parts kits. Heat Exchanger Assembly, H250FD. Heat Exchanger Assembly, H350FD. Heat Exchanger Assembly, H400FD. Tum pump, main as valve, and heater power off. Remove drain plug and drain water out of heat exchanger. If necessary, disconnect header union fittings from pool/spa piping. Pull temperature limit switch wires through the grommet on the heater side panel. And disconnect limit switch wires from heater wire hamess. Remove screws and remove both of the upper plastic heater side panels (see Figure 1 for screw locations, and Figure 2 for part locationhdentification). Disconnect the 2 wires from the pressure switch. Which is located on the inletloutlet header. Remove countersunk screws on heater top and remove louvered exhaust panel on heater top (see Figure 2). Remove the heater top tlue cover by removing 3 screws on each side of the heater (see Figure 2). Remove screws and remove rain shield assembly (see Figure 2). Note that there are screws which hold the rain shield assembly to the heat exchanger tube sheets, which also must be removed. Remove the front access panel and the control box cover (see Figure 2). Disconnect the temperature sensor plug from the circuit board located inside the control box. Pull the temperature sensor wires out of the control box and through the hole in the heater cabinet. Carefully lift the heat exchanger up and out of the heater cabinet. Before installing the new heat exchanger assembly, install the new adhesive-backed gaskets (included in this kit) onto both , of the new heat exchanger tube sheets. Install the new heat exchanger assembly. Ensure the heat exchanger is properly oriented with the arrows on the tube sheet decal pointing up. CAUTION: Do not install heat exchanger upside down. Heat exchanger is labeled to indicate the proper orientation. The heat exchanger will be damaged if installed incorrectly. Remove the pressure switch from the old heat exchanger assembly and install on the new heat exchanger assembly. Apply pipe thread sealant to the pressure switch threads before assembly. Reverse the above steps to reassemble the heater. Activate water pump and check the system for leaks. The item “Hayward FDXLHXA1350 Heat Exchanger Assembly Replacement for Hayward H350FD” is in sale since Wednesday, November 15, 2017. This item is in the category “Home & Garden\Yard, Garden & Outdoor Living\Pools & Spas\Pool Equipment & Parts\Pool Heaters & Solar Panels”. The seller is “wpmpools” and is located in Granada Hills, California. This item can be shipped to United States.